High Quality. Low Price. Introducing Gladiator. We introduced Gladiator paddle boards to our shelves in 2018 and we haven’t looked back. They have quickly become one of our best selling brands, for good reason. 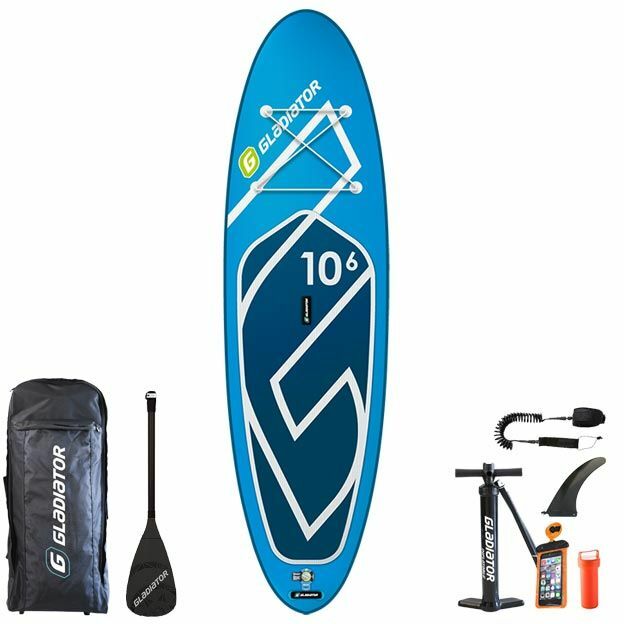 Gladiator pride themselves on creating paddleboards with a premium build-quality and high-end materials, at a great price. Although the technology that they use can compete with the bigger premium brands, their prices are far lower, starting at only £369! For 2019, Gladiator have introduced two ranges; the Gladiator Lite and Gladiator Elite. 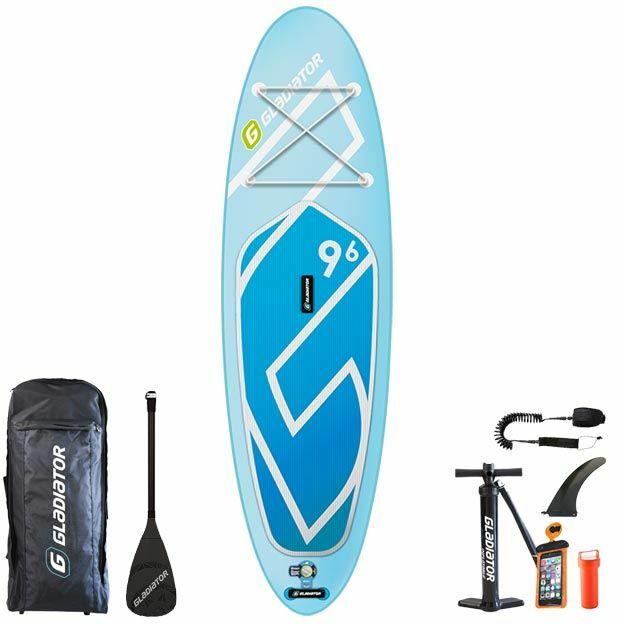 Starting at £369, the Gladiator Lite range includes kids, allround and touring boards that are constructed with a single skin stringer technology, similar to the Fanatic Fly & Ray Airs (the blue ones). They include features such as centre and rear handles for easy carrying and bungee tie downs for carrying kit. The rear handle is also great for stowing your paddle whilst chilling on the board or doing some SUP yoga. 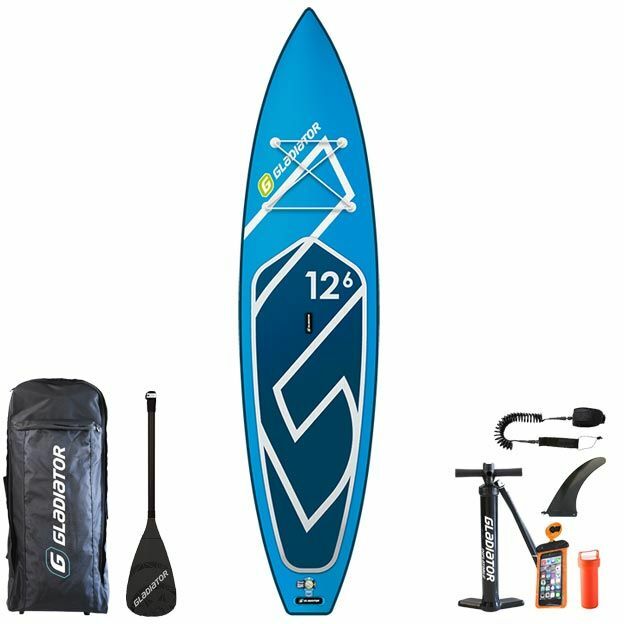 The Gladiator Elite starts from £489 and features a premium construction similar to that used by Fanatic Premium and Red Paddle Co. This makes for a stiff and light board, with great glide and stability. Like the Lite boards, they include all of the features you’d want, such as a cargo net for stowing a dry bag or water bottle and a rear handle for ease of walking with the board in very shallow water. Both the Gladiator Lite and Gladiator Elite boards are made from 4.7 inch thick drop stitch in their allround shapes and 6 inch drop stitch in their 12’6 touring shapes. The Gladiator Elite construction is very similar to that used by the biggest brands, for example Red Paddle Co with their "MSL Technology". 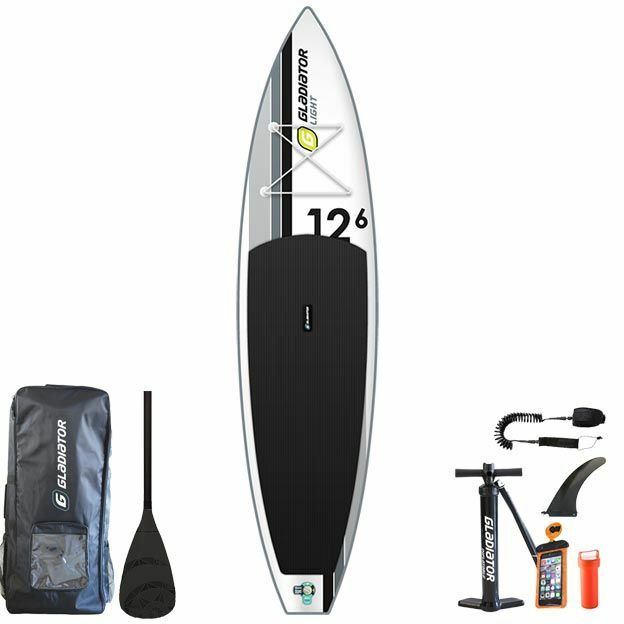 It creates a SUP with the desired stiffness but at a 30% lighter-weight than a full-double layer construction. The Gladiator Lite is a similar construction to that of Fanatic Fly & Ray Air and Starboard.  Offering a fantastic 3 years warranty on both ranges, Gladiator has full confidence in the build of these boards. They own their own factory making ribs and paddle boards. They value their staff and offer a fantastic working environment; the attention to detail and build quality is high. They use high density paddleboard specific drop stitch in the boards so it’s ultra strong and well made. Like all premium brands e.g. Red Paddle Co, Gladiator make their boards in 4.75 thick dropstitch material. This, we believe, is key. Lots of paddleboards are unfortunately made from 6 inch thick dropstitch which, in an all-round shape, means the board is too high out of the water creating instability issues due to wind or waves. Both the Gladiator Lite and Gladiator Elite come in a range of size options, so there’s something for everyone. Whether you have kids wanting their own board, are a family looking for a board to share, want an allround SUP for a bit of everything or are an adventurous paddler after a touring board, Gladiator have a something to cover all needs and budgets. SUP Inflatables has been the UK's number one Inflatable SUP Company since launch 8 years ago. Our parent company has been trading since 1985, so we take our reputation very seriously. We wouldn't dream of stocking a cheap-n-cheerful product that won't perform well and stand the test of time. We've spent much time testing these Gladiator SUPs, and we really rate them. If you're looking for a lower price but decent quality iSUP, then look no further.